One of the questions many backpackers ask themselves is just how much of their travelling itinerary should they plan ahead before they set off? The answer to this question lies in just how much of a free spirit you are! For some simply having a return plane ticket is too much organization. Other travelers wouldn’t feel comfortable hitting the road unless they had a full itinerary and confirmed hotel or hostel reservations in every town and city they choose to visit. The pro of booking your holiday accommodation in advance is that you can be sure you’ll have somewhere to rest your head when you get off your plane and just want a lie down! If you’re visiting a new city during an important festival or national holiday then it will also give you the security of having a room when one might be hard to come by. The con though is that it is much harder to be spontaneous: if you meet a handsome stranger and want to stay somewhere a little longer then you could lose the deposit money you’ve already laid out for future hotels if you can’t stick to the schedule you’d planned months in advance. The most common accommodation type for travelers and backpackers looking to spend a significant amount of time away from home is the hotel. Obviously hotel prices vary wildly, depending on whether you’re looking for a luxury or a budget room. Most travelers are looking for budget hotels. These will offer a comfortable bed, somewhere to shower (in either an en suite or communal bathroom) and other basic facilities, but don’t expect a maid service or mint on your pillow each night! If you’re looking to save even more money then why not try a hostel? If you’ve never stayed in a hostel before then it can be a daunting accommodation type to choose. 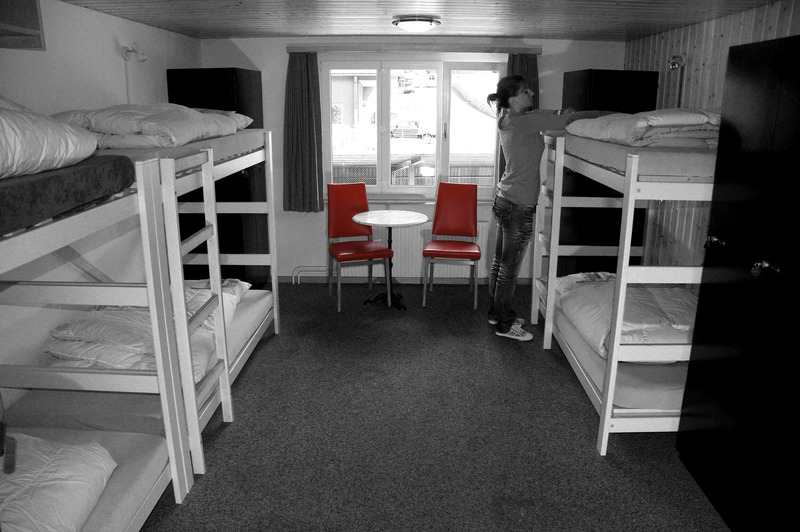 Hostels tend to be much more basic than hotels, with fewer amenities, and you will usually have to share a dormitory style room with several other travelers that you might not know. The benefits of this, however, are that you may quickly find yourself making friends with like minded travelers and that hostel rooms are significantly cheaper than hotel rooms. If you’re travelling with a large group of friends, rather than on your own, then you may find that your numbers make it more cost effective to hire a holiday cottage or timeshare for the duration of your visit. The benefit of this is that you’ll be afforded a little more luxury in this kind of self catering accommodation, with your own kitchen and somewhere to do your laundry! Finally, you should consider where you will be eating during your travels, and how your accommodation can help to accommodate this. As mentioned above, self catering accommodation such as a time share or holiday cottage will come equipped with a kitchen, making it simple to whip up some affordable eats. Many hostels also come with communal kitchens for backpackers on a budget, providing you with somewhere to make sandwiches or store food from the grocery store: much cheaper than eating out every day! If you choose to stay in a hotel then you will have fewer options when it comes to storing your own food, however you can keep some small snacks in your room: snacks in foreign restaurants can often cost as much as a meal, so this is a great way to save money Just be weary of using the mini bar, even for keeping snacks and drinks cold, as many sensitive hotel mini bars will attempt to charge you just for opening the door! If you do have tight budgetary constraints though, maybe an accommodation option that will allow you to cater for yourself is the best choice for you! New Service Announcement: IWB Channel Manager now connects directly to LateRooms.com and 5 additional new sites, including HouseTrip, FlipKey, Ebab.com, Wimdu.com, and 9Flats. Connect to these services now for no additional cost. IWB Channel Manager already connects to over 150 of the most popular booking sites. If you’re not already using this valuable service, you can immediately connect your calendar to sites like Booking.com, Expedia, HostelWorld, Orbitz, Travelocity, and many more. Many accommodations use these booking sites to increase profits. But, learning how to use multiple calendar interfaces can be a real hassle. Avoid the hassle, because you only need to update one calendar of availability. If you haven’t tried IWB Channel Manager before, now is the time. The cost is only $14 per month. Eliminate many hours of work each week. If you already use a channel management service, now is the time to consider switching. Stop paying too much. Instant World Booking offers incredible savings and convenience. Why sign up for Channel Manager today? Sign up today, and have all your calendars synchronized by tomorrow. You can purchase just one month at a time, so there’s nothing to lose by trying it. Just log into your profile and proceed to the Channel Manager page. Would you like to automatically update sites like HostelWorld, HostelBookers, Booking.com, Expedia, Orbitz, and 150 others, every time you receive a reservation? Now you can. IWB Channel Manager now offers this incredible capability. Don’t underestimate the power and value of this feature until you’ve tried it. Whenever you receive a booking on any channel or website (e.g., HostelWorld, Booking.com, Agoda, etc. ), your availability calendar is immediately updated on all connected sites. Over 150 booking sites are available. Even update all your calendars when you receive a reservation from your own website (with IWB Booking engine). Imagine the savings you can achieve in both time and money. Get started today with Channel Manager at prices as low as $14 per month. Get 4 months free when you sign up for a year. Just log into your profile and proceed to the Channel Manager page. Un Regalo di Capodanno – Più di 150 canali! IWB Channel Manager ha aggiunto nuovi canali di prenotazione. Ora è possibile caricare il tuo calendario di disponibilità di oltre 150 siti di distribuzione in una sola volta. In precedenza, circa 30 canali di prenotazione erano disponibili per un costo mensile di circa €11 ($14). Questa era già una grande offerta. Ora, abbiamo aggiunto 5 volte il numero di canali di prenotazione, tutti allo stesso prezzo. Questo è un valore senza precedenti. Iscriviti alla IWB Channel Manager ora. – Tutti i siti hostelling principali compresi, anche HostelWorld.com, Hostelbookers, ecc. Se non hai provato IWB Channel Manager prima, ora è il momento. Eliminare le ore e ore di lavoro ogni settimana. Se si utilizza già un servizio di gestione del canale, ora è il momento di prendere in considerazione il passaggio. Smettere di pagare troppo. Instant World Booking offre risparmio incredibile e convenienza. Iscriviti oggi, e hanno tutti i calendari sincronizzati entro domani. Non c’è niente da perdere a provare. Basta accedere al tuo profilo in InstantWorldBooking.com e procedere alla pagina di Gestione Canali. Prendi un nuovo Motore di Prenotazione per il tuo sito. Gestione calendario una volta sul vostro sito web e tutti i tuoi siti di prenotazione esterni. Instant World Booking ha il prezzo più basso garantito. Non ci sono eccezioni. Abbiamo anche più opzioni di maggior parte dei dei fornitori di servizi. Basta contattarci per un preventivo personalizzato. Se non siamo in grado di ridurre i costi correnti, per ottenere il nostro motore di prenotazione gratuito per un anno. Questa offerta è un virtuale “game-changer”! Scegliere un piano con o senza depositi della clientela. Personalizza i tuoi pagamenti. Instant World Booking offre più servizi e opzioni di pagamento rispetto a qualsiasi altro fornitore. Inizia subito! Non c’è alcun obbligo. Crea il tuo motore di prenotazione ora? Soluzioni Complete di Alloggi: Software di Ricezione – Motore di Prenotazione – Pagamenti – Gestione del Canale. Ottieni di cui per iniziare. Hassle-free set-up in just minutes. IWBFrontDesk.com offers all the features you need from a Property Management System (PMS). Suitable for Hostels, Backpackers, Small Hotels and Inns, and more. Within minutes, you could be saving from 30% to 75% versus your current provider. Why not start increasing your profits today. Engineered as an alternative to products like RezOvation ®, Webervations ®, SuperInn, Resnexus ®, Hostel Power, HostelMate, etc., IWBFrontDesk has one major advantage: Savings of 30% to 75% or more over competing services. With prices so low, you can’t afford not to try it. We not only reduced booking fees, we eliminated them for most budget accommodations.Find the cheapest accommodations in your favorite destinations. Get the lowest price on your accommodation.In addition to no booking fees, we now guarantee that you get the lowest price for your travel reservation. Reserve today with confidence. Instant World Booking now offers some of the biggest selections of accommodation, including a multitude of unique properties that can’t be found anywhere else.For boutique hotels, hostels, and B&B’s, Reserve the world today with Instant World Booking. Will you need to check your e-mail, surf the Web, or share pictures or videos while you’re traveling abroad? If the answer is yes to any of those activities, then you’ll need to add an international data package to your plan, or you could end up with a massive wireless bill. These can be had for as little as $25 per month from all the major carriers and can be canceled as soon as you return home. (Just be sure to buy enough data access so you’re not charged extra; the cheapest options are often rather skimpy.) Another option: if you can wait until you’re back at a hotel Wi-Fi hot spot to check your mail or use your apps, then just turn off your phone’s roaming capabilities (usually found in the Settings area). Use your airline miles. If you have collected a lot of miles or achieved elite status with one or more airlines, this offers benefits to members, sometimes including free baggage. Use a credit card that offers incentives, like a “first bag free” benefit. The Continental OnePass MasterCard and the Delta SkyMiles Credit Card from American Express are two cards that offer such benefits. And using the card to save the baggage fees can offset the cost to obtaining the card. When searching for a flight, compare not only ticket rates but also the baggage fees, which are usually not quoted within the rate. The baggage fee can sometimes make the total cost of one carrier more than another. JetBlue offers one free checked bag. Southwest Airlines offers two. Upgrade your ticket. If you have the miles or the money to upgrade to a Business Class ticket, the cost of your baggage will often be waived. HostelTraveler (Instant World Booking) is your cheapest option for hostels around the world. Our new Lowest Price Refund Guarantee is a promise that you won’t find cheaper hostel prices elsewhere. We’re cheaper than Hostelworld, Hostelbookers, Hostelsclub, and the rest. While our friends at other booking services are comparing and trying to out price each other with advertising campaigns, you can book with confidence at HostelTraveler. That’s because we’re offering a guarantee that you’ll receive the lowest available price. So, don’t bother looking any further. Reserve with confidence knowing that, if you find a lower price, we’ll refund you double the difference. It’s that simple. How can we offer this incredible guarantee? Because, HostelTraveler is one of the most economical online reservation providers, serving over 10,000 unique hostels and specialty budget properties worldwide. And, because we provide superior service and technology, we don’t gouge our accommodation partners with exorbitant commissions. So, we can pass on the savings to our travelers. We are absolutely committed to offering the lowest prices for hostels. You can now book with confidence, because you won’t find any of our hostels cheaper elsewhere on the internet. If you are able to find a better deal for the same travel dates and with the same booking conditions, we’ll refund double the difference. See more about the terms of our Lowest Price Refund Guarantee below. We think you’ll agree that no better guarantee is offered anywhere. (1) Contact us within 7 days of booking your accommodation through HostelTraveler (Instant World Booking), or one of our 100+ travel websites. Your booking must be completed on one of Instant World Booking’s websites, not a lodging’s website or other affiliate site. (2) Tell us the details of the lower rate you were offered. The lower price must be available to book during the 7 day period following your reservation, and we need to be able to verify the offer. (3) The guarantee will not apply to lower prices advertised within 7 days of arrival date. (4) The lower price must be available on a website other than hosteltraveler.com. (5) The “lower price” consists of the total cost of the reservation, including the daily rate, any included meals and extras, and all booking fees and taxes. The “lower price” must be found on a website for an equivalent room at the same lodging accommodation for the same period as your reservation, and with the same conditions. (6) Instant World Booking will make refunds only if your reservation through Instant World Booking completed and not cancelled or the subject of a no-show. Refunds will only be given after the departure date, once the terms of your reservation have been fully completed. (7) If a refund is given, you are still bound by the terms and conditions of your existing reservation confirmed through Instant World Booking. (8) The lowest price guarantee does not apply to accommodation reserved in combination with a membership rate, frequent stay, reward type program, or special promotion offered by the accommodation provider. (9) The lower price must be a regularly advertised price for your reserved hotel, not a price received from an ‘opaque’ site or auction site, where the exact location or price is not known until after booking. (10) The maximum refund that will be provided by Instant World Booking is limited to the total confirmation payment made at the time of your reservation. (11) Instant World Booking reserves the right to withdraw this offer at any time without prior warning or notification.